Math Matters is a series of stories with real-life math connections. Each engaging book offers real-kid characters who confront humorous dilemmas and come up with clever solutions. 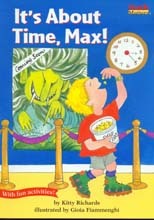 When Max loses his digital watch he must come up with a way to learn how to really tell time!